Social media, networking, tweeting, status updates, joining groups… all these terms are becoming part of everyday life for many and with social media offering such a wide spectrum of advertising space; employing SEO into your latest Tweets is a trick worth noting! The Internet should be thought of as a huge open space full of opportunities to advertise and market your product or business – every opportunity should be taken full advantage of. The social networking scene came, saw and conquered the world within an extremely short time frame. Its popularity makes it an ideal canvass to build your business from. Why not take advantage of Internet marketing while you network and mix work and play? This is the first thing everyone should do when they join a networking site and it is one of the easiest ways to get your business noticed. Use photos of your products and invite friends to join your group as well as asking them to spread the word to their friends and so on. Also, check out businesses that offer similar products and if their friend list is visible; use it! 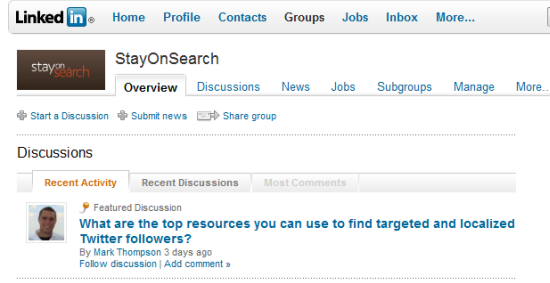 Check out the new StayOnSearch LinkedIn Group! There’s people out there who like your products, so let them promote them to their friends via Facebook, Twitter, and so on. There’s a good chance their friends will like it as well! Some shopping carts such as Volusion even have these features integrated out of the box, but it’s usually pretty easy to add them. Check out “Where To Get Social Media Buttons For Your Blog” to easily add ways for people to promote your products. Once you have created a group, status updating or ‘Tweeting’ about a new product, a sale or promotion, special discounts, offers or generally any new and exciting information about your business is a simple yet effective way to raise awareness. Building your ecommerce business successfully is all about marketing and increasing site traffic and with the world at your fingertips on social networking sites; it is an effortless way to promote for free! If they can see your business, admire your products but have no easy way to get to your website then people simply won’t bother. The Internet has made us lazy and if things are hard work to find then the majority of people won’t bother trying to find them! With this in mind, you want to scatter links to your website on your profile or group page that are visible and easy to find and follow. 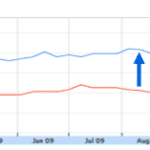 Of course, links can have SEO value as well. Some links in social media are ignored by Google, but regardless of that, they are still good to have just for users, and if Google picks up a few them, so much the better. Growing an e-commerce business is hard work and using all the advertising mediums possible is key to success. Use social media to your advantage – engage your audience, keep them interested (and entertained if you can! ), and grow your business.